As well as offering commercial respraying services, Pro Coatings also offer domestic respraying so that homeowners can get the perfect aesthetic for their property. In this project, Pro Coatings Solutions were called in to respray some existing rosewood coloured uPVC windows in a domestic property. 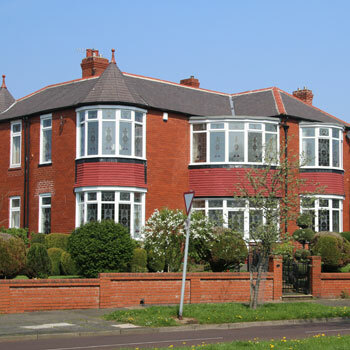 The customer wanted 5 bay windows, 2 small windows, a front door and a side screen to be painted white in order to be in keeping with the aesthetic of other homes in the street. All of the uPVC window and door frames were prepared and cleaned before respraying in order to provide the highest quality finish possible. We added additional coats of paint so that an even, brilliant white could be achieved, in keeping with the customer’s wishes. Access to the site, due to the sloping of the gardens for the ground floor items was a challenge. This combined with the occasional deluge of North East rainy days made the project particularly challenging. However, our on site team of painters quickly assessed the problems and work was able to progress quickly, efficiently, and to our usual high standard. Over the course of three days, we resprayed all of the uPVC windows and doors white. The customer was delighted with the finished result.